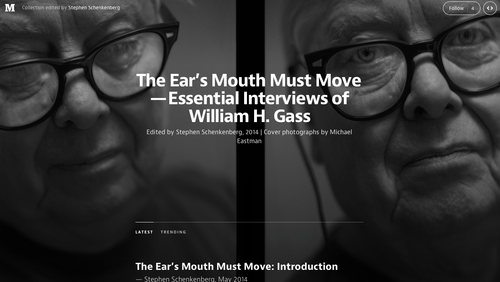 Happy to have my interview included in The Ear’s Mouth Must Move — Essential Interviews of William H. Gass, edited by Stephen Schenkenberg, alongside heavyweights like John Gardner, Thomas LeClair, and KCRW’s Bookworm‘s Michael Silverblatt, not to mention Magister Gass, himself. Apparently, my interview, “Sentenced to Depth,” is a 94-minute read. Free to all and readable on any device, the microsite collects 13 essential interviews that Gass gave between the late 1970s and 2013. It’s titled The Ear’s Mouth Must Move, a phrase of Gass’ own. The pieces feature text, related historical photography, video, and a handful of marginal notes and links that might be of interest to readers.